(Newser) – Listen, that lawn isn't going to mow itself, tornado or no tornado. 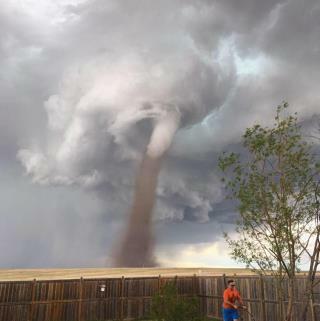 A photo of a man in Alberta, Canada, taking care of his lawn chore with a twister in the background has gone viral, reports UPI. Cecelia Wessels posted it to Facebook with the caption, "My beast mowing the lawn with a breeze in his hair," referring to her husband, Theunis. Windows 7, download the picture, then save as desktop background. Great quality! now that's a man who seen a few tornado in his lifetime.